According to lal kitab astrology , Sun + Rahu is considered very inauspicious combination irrespective of their placement in all 12 houses and is considered as Eclipse. Unlike general belief, Moon + Rahu is not an eclipse. Sun placed with inimical or malefic planets gives bad results for that planet and house. Native suffers in the age 22nd to 45th year of life depending upon the planets in conjunction. Serving people related to Mercury will ward off evils. When friendly planets also joins the above conjunction, than friendly planets themselves suffer and inimical or malefic planets will not suffer. Native faces problems from government but recovers after short time. When Mercury and Venus are together in the horoscope or associate with each other, the malefic effects of eclipse are minimized. Native will get good results after 39 years. When Sun + Rahu are placed in 9/12 houses, it gives highly malefic results. If Mars is also ill placed in the chart or Rahu afflicts Mars, native may have poor health and short life. Native may have black-white spots on his body. 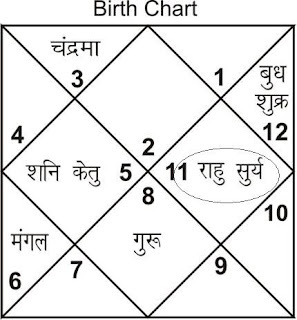 Sun + Rahi in first house and Sat/Mars are placed in 5/9 houses, native is blind since birth. Sun + Rahu in III House: Mercury and Ketu gives bad results till 34 years of life. For protection from theft or unforeseen loss: Put barley (Joo) under weight in a dark place. For illness: Put barley in flowing water after washing with milk or cow's urine. To get benefic results of Sun: Donate items related to Mercury and Venus. Put articles related to Rahu in flowing water at the time of Solar eclipse in day time. Take some copper coins. Put them in fire (preferably using Kachha coal) whole night for at least 12 hours. Next morning, put the copper coin in flowing water. Please make sure that when you go out of your house, your children should not come in front; so avoid this remedy during holidays, Saturdays, Sundays etc. Do not perform more than one remedy at a time.